Hot Air Balloons Fly High in Rock Hill! | …. celebrate a birthday, make a wedding proposal, fulfill a bucket list wish, or have a high-flying tether event from the skies! 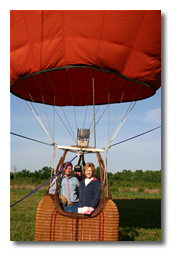 Hot air ballooning is an adventurous, fun, outdoor activity that you can enjoy right here in the Rock Hill / Charlotte area and remember all your life! Enjoy the beauty of Rock Hill and the surrounding South Carolina and North Carolina areas while hot air ballooning! Eagles Wings Hot Air Balloons offers you this unusual outdoor activity and the chance to see the the beauty of the greater Charlotte, NC and Rock Hill, SC area. Whether you are looking for ideas for birthday gifts, anniversary gifts, a romantic get-away, or a bucket list dream come true, we can make it happen! Fulfill a desire you always thought was not possible, or plan a great activity for your vacation at Lake Wylie or Lake Norman …. do something really fabulous for yourself and take the opportunity to see the world from a hot air balloon! The hot air balloon experience is an attraction that you won’t want to miss …. an adventure to remember for a lifetime! And what is our favorite hot air balloon experience? We just love to take young couples up in the air for surprise marriage proposals! Talk about something that will never be forgotten! We look forward to having you on board! Take time to check out the rest of our site to get a better idea of what your trip in a hot air balloon will be like.